Even though markets are hitting all-time highs there are still opportunities out there, I present 10 undervalued stocks with healthy expected forward returns. Bank OZK has still not fully recovered from the significant drop in 2018 and currently offers investors a historically high dividend yield. MO has rebounded nicely since 2018 low's however there is still plenty of room for growth. The S&P is up 15.39% year-to-date (as of 4/5/19) and investors are slowly starting to forget the woes of 2018. After an excellent quarter you may think that fairly valued opportunities are thinning out. However here are ten high yielding stocks worth a closer look. Before we dig deeper into what I think are the top 5 stocks from this list, here is a brief explanation of the methodology. The undervalued percentage was computed using a combination of dividend yield theory and normal PE ratio. The forward return is a combination of dividend yield, analyst forecast growth and PE contraction or expansion. Additionally the forward return is an estimation of a long term (5-10 year) annualized return. 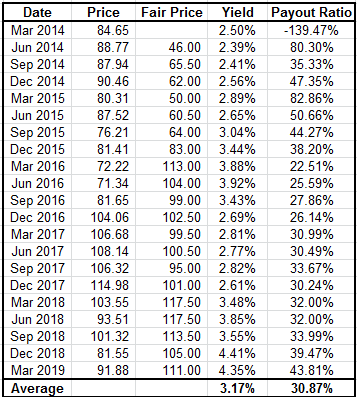 The price and dividend yield are as of market close on 4/5/19. More importantly, these valuations rely on assumptions and therefore should be viewed as such. Valero (VLO) has increased their dividends for the last 8 years. VLO began increasing their dividends in the early 2000's until the financial crisis hit. Unfortunately, in 2010 they had to cut their dividend but shortly thereafter resumed increases. 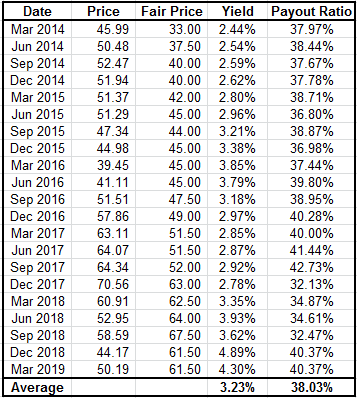 Their growth since 2010 has been quite fast, the 5-year annualized growth rate peaked in the low 50% range and currently sits just above 30%. 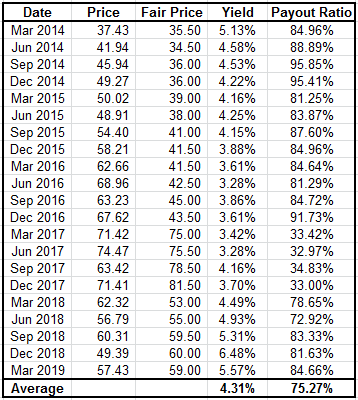 Of course these growth rates are inflated due to the dividend cut, either way long term investors that held or initiated new positions have been rewarded handsomely. Here is a quick look at VLO's dividend history. VLO's current dividend yield of 4.15% is considerably higher than their trailing average yield of 3.52%. This is mainly due to price contraction during the 4th quarter of 2018 and a 12.5% dividend increase in 2019. The current payout ratio of 49.66%, although slightly above the trailing average, is at a comfortable range going forward. The current price is roughly 1.5% undervalued and VLO boasts a high expected long term forward return of 19.3%. Bank OZK (OZK) has increased their dividend for the last 23 years. Their dividend increases are unique in the fact that they increase each quarter. Just recently OZK announced another increase of $0.01 for the April dividend. OZK has maintained a running 5 year annualized dividend growth in excess of 10% since 2004. Growth slowed slightly during the housing bubble of 2006-2007 and in early post recession 2009, however kudos to OZK for continuing to grow their dividend during those turbulent times. 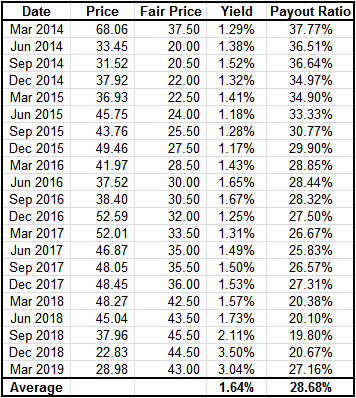 Here is a look at OZK's dividend history. OZK's current dividend yield of 2.88% is significantly higher than their trailing average yield of 1.64%. The current high yield is mainly attributable to a steep price decline during 2018 associated with a one-time significant write off of two bad loans. While the stock price has recovered quite a bit from the 52-week low, I believe it will continue to recover barring any future negative news. 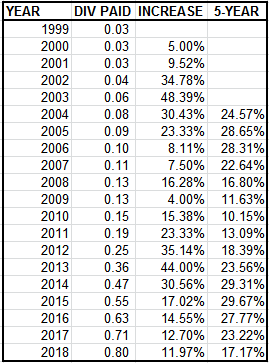 The current payout ratio of 27.16% is right around the trailing 5 year average of 28.68%. This is a very comfortable payout ratio that leaves plenty of room for future dividend expansion. 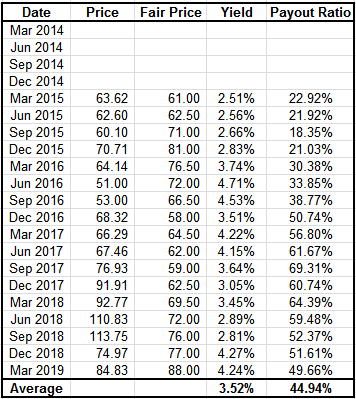 An interesting thing to notice about OZK is the fair price in the table below, with the exception of March 2014 which is not adjusted for the stock split of May 2014, the fair price has consistently increased over the last 5 years. However only recently has the stock price dropped below the fair price due to a major event. I believe that a consistently increasing fair price estimate shows consistent growth of a business. The current price is roughly 40% undervalued and OZK boasts a expected long term forward return of 18%. Altria Group Inc. (MO) has increased their dividend for 49 years, they by far have the longest growth streak of all the companies on this list. 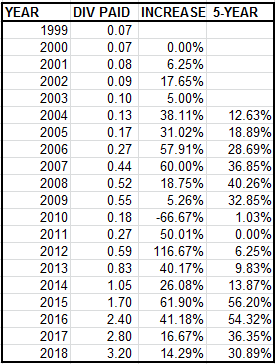 As you can see dividend growth has remained very steady around 8-9% since 2000, with an unexpected, but I'm sure highly appreciated 35% increase in 2008. Here is a look at their dividend history. MO's stock price has enjoyed healthy growth between 2014 and 2017, then a little stagnation set in and the dip in late 2018 has presented an opportunity for long term investors. The current dividend yield of 5.84% is significantly higher compared to a trailing average yield of 4.31%. The payout ratio of 84.66% is a bit high, however the company has a stated target payout ratio of 80% and therefore it is within reasonable range. Year to date MO is trailing the S&P with a 10.89% gain, however the recent price dip moves them into undervalued range. Based on my assumptions the stock is roughly 7.7% undervalued and has a forward expected long term growth of 13.5%. Prudential Financial Inc. (PRU) has increased their dividend for 10 years. Unfortunately like a many other companies they were forced to cut their dividend during the financial crisis. 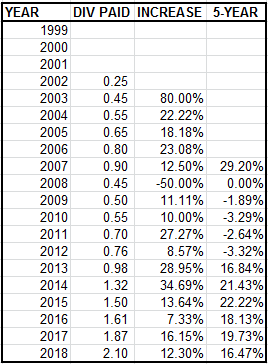 Dividend growth prior to the financial crisis was a solid 20%+, however that streak was ruined by a 50% cut. In 2009 PRU resumed increasing dividends and has achieved decent overall growth. The running 5 year annualized growth rate is currently in the mid teens. Here is look at their dividend history. The stock price remained stagnant in 2014 and 2015, in early 2016 the price took a small dip but quickly recovered and spiked by almost 40%. 2017 and 2018 saw continued stagnation with a 20% dip in late 2018. Year to date PRU is up 20.75% however they still remain undervalued. The current dividend yield of 4.06% gives investors a great entry point almost 1% above the trailing historical yield of 3.17%. The payout ratio has started to slowly creep up but remains at a comfortable 43.81% leaving plenty of room for future growth. A 12.7% discount to fair value and an expected long term forward growth rate of 13.3% make PRU look attractive. Principal Financial Group Inc. (PFG) has increased their dividend for 10 years. 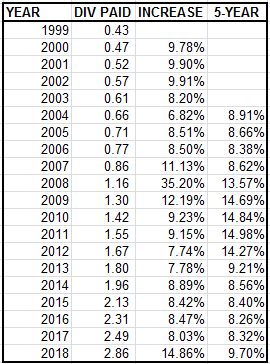 The running 5 year annualized dividend growth rate has been declining but remains healthy in the mid teens. This decline was expected since the long term growth rate was inflated by dividend increases after the 2008 dividend cut. I believe the long term dividend growth rate should plateau in the low teens. Here is the dividend history of PFG. PFG's stock price remained flat in 2014 and early 2015, in late 2015 and early 2016 the price dipped, the rest of 2016 and 2017 followed with steady growth and in 2018 more market turbulence knocked the price back down. The current dividend yield of 4.06% offers a great entry point when compared to the trailing average yield of 3.23%. The payout ratio has remained very steady and currently is just north of 40% leaving plenty of room for future dividend expansion. PFG is currently 15.6% undervalued and offers an expected long term forward growth rate of 11.3%. No matter how great the market is doing there are opportunities if one looks close enough. While I believe these stocks are great opportunities, they are only such if they fit your investing goals. Additionally the information reviewed here constitutes only a preliminary review of a company and each investor should conduct further due diligence. Disclosure: I am/we are long OZK, mo, PRU. I wrote this article myself, and it expresses my own opinions. I am not receiving compensation for it (other than from Seeking Alpha). I have no business relationship with any company whose stock is mentioned in this article.